New Jersey-based progressive metal quartet ETHERIUS will release their stunning new instrumental progressive metal EP entitled "Thread of Life," out August 24. The impressive new five track offering is available for pre-order via Amazon, iTunes and Google Play. You can also stream select tracks now via Spotify. ETHERIUS have revealed part two of a three-part behind the scenes video series detailing the making of "Thread of Life." Exclusively hosted by Gear Gods, each part highlights drums, bass and guitars individually. This week, the band showcases recording bass parts with bassist Chris Targia, with a cameo from co-producer Angel Vivaldi. Watch part two here: geargods.net/behind-the-scenes/etherius-track-bass-with-angel-vivaldi-in-this-exclusive-behind-the-scenes-for-thread-of-life/. In the video, Chris Targia say, "I like to be very varied with my play style, depending on what section of what song needs what. So sometimes I'll be playing with a pick, sometimes I'll be playing with fingers or slap, and I also have a fretless bass I used on the beginning of the song 'Thread of Life.' Fretless allows you to be more expressive with slides and vibrato." ETHERIUS was formed by guitarist Jay Tarantino in 2017. After gaining experience as a touring rhythm guitarist for guitar virtuoso Angel Vivaldi, Tarantino decided to branch out on his own with the goal of making music unlike the djent/electronic stylings of the current instrumental guitar scene. The result is ETHERIUS - a fresh new take on progressive metal/neoclassical shred incorporating classic thrash elements. In addition to Jay Tarantino and Zaki Ali, ETHERIUS features bassist Chris Targia and second guitarist John Kiernan. The concept of "Thread of Life" and the album's artwork were inspired by ancient Greek mythology, specifically TheMoirai (moy-ray), or "three fates." "Thread of Life" was produced and engineered by Jay Tarantino and Zaki Ali with Angel Vivaldi acting as co-producer, was recorded at Backroom Studios in Rockaway, New Jersey (owned by Dillinger Escape Planguitarist Kevin Antreassin), and was mixed/mastered by Mutiny Within vocalist Chris Clancy at Audioworks Productions. Additional tracking was completed with Angel Vivaldi at his home studio. 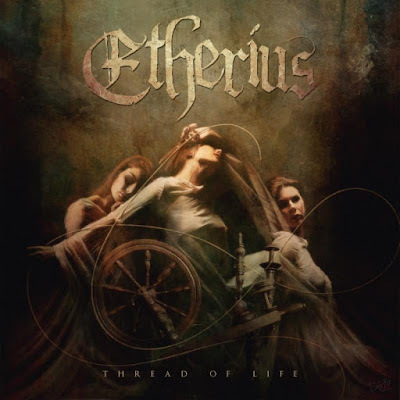 With one listen to "Thread of Life" it's clear that combined, the four extremely talented musicians of ETHERIUS produce a clean, awe-inspiring sound merging powerful progressive elements that will appeal to not only the most discerning and critical metal fans, but to the heavy music-loving masses as well. Members of ETHERIUS are currently endorsed by Kiesel Guitars, Ernie Ball Music Man, and Reunion Blues.